Paula covers this fall's joint Oregon-Washington conference, increased interest in reviewing and updating the GMA, and various strategic issues the organization is involving itself with. Planners come from many different backgrounds, such as the planning director of Zillah who originally majored in history and political science. Organizations are encouraged to be sponsors for this year's conference in Portland. 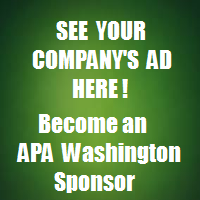 APA-Washington Chapter and Sections Elections Are "Just Around the Corner"
Voting takes place from August 5 to September 8, with three chapter sections having numerous openings. The Washington Sea Grant is receiving assistance from NOAA to protect coastal communities from various environmental risks. University of Washington faculty lead summer study abroad program. Scandinavia provides many lessons for transportation planning in the Northwest.